Small and innocent looking but honestly quite a beastly card. You install this in a huge scoring remote and make the ice in it stronger. Combos extremely well with Jinja City Grid,Surveyor and Mti Mwekundu. You can also rez this during any paid ability window. So no worries if you have this as your last ice with 3 others in front of it, just flip it right away. And as icing on the cake it is a mini Pop-up Window. Has potential to make glacier an even bigger powerhouse. It does die instantly to Chisel though. As someone who played during the format when Keyhole anarch was predominant, I was very happy to see that card rotate. It led to very tiresome games where as a corp you were locked out of any line of play, as well as having to shuffle your deck dozens of times over the course of a match. So when I saw we're getting a replacement for Keyhole, I was hesitant at best and ready to bring out my pitchfork and torch at worst. Will Stargate be as prone to being a NPE as Keyhole though? I doubt it. Let's look at the card with an open mind. First off, the numbers on it are identical to its predecesor. 4 to install, 2 MU program, 3 influence, look at 3 cards and trash 1. This is not a card you include lightly, you build around it. In the past, anarchs tended to play Eater in their decks as a way to complement the "instead of accessing" part. But anti-ai ice is more popular now than ever due to Aumakua, and with Account Siphon rotated, Eater decks have fewer tools to be oppressive. On that topic, let's look at the ways this card is more balanced than Keyhole. The big one is obviously that Stargate can only be used once per turn. 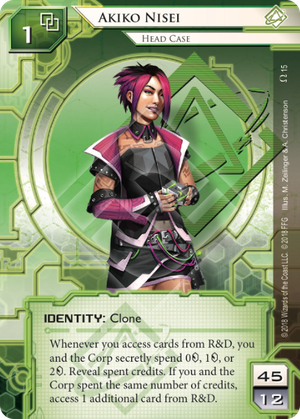 No more running R&D 4 times and trashing 4 cards, or shenigans with additonal clicks (such as when Hyperdriver was legal). The runner gets 1 shot per turn. On top of that, the 2 cards that aren't trashed are returned to the top of R&D in the same order. This actually benefits the corp, as they will know which card is coming up due to the absence of a shuffle. This does make Stargate actually stronger in a way. While constant randomizing of cards was very annoying, the corp still had a chance to top deck the one card they needed to get them out of a precarious situation. Stargate makes this more difficult. The runner runs, sees 2 bad cards and 1 amazing, trashes the latter, the rest go back. Now the corp has to draw those cards and make the most of it, cause the runner can just go again on their turn. Keeping all this in mind, this is definitely a card to fear going forward and I am not a huge fan of it. But I will say,, it is a good act of balancing by Nisei, which I respect. So, this card has some similarities to Mr. Li, which never saw any play, and this is more expensive. 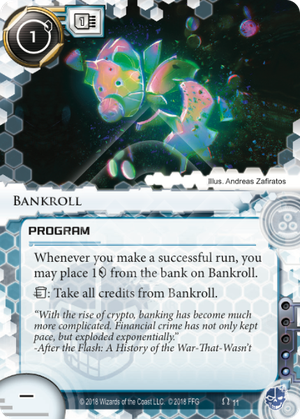 So why do I think The Class Act will be way more popular in criminal decks? First off, the math is just way more favorable for this new connection. Mr Li has a total cost of 5 (3 credits, click to install and the card itself), while TCA only has a cost of 2 (4 credits + 1 card + 1 click - the 4 cards you draw). This is significantly better, and getting to start your next turn like Andromeda gives you a ton of tempo. Remember, since this triggers at the end of your turn, after hand size is checked, you don't discard the cards. Furthermore, TCA is way more versatile than Mr Li. The latter only gave you one line of play: spend a click to look at 2 cards, and draw the one you need. The former works with ALL draw engines. Earthrise Hotel, Deuces Wild, Diesel, Build Script, the newly spoiled blue Diesel, all of them will trigger TCA and allow you to draw even more efficiently. The only disadvantage TCA has is that it only triggers the first time you draw, while Mr Li could be used as often as you'd like. But I consider this a very minor minus. At 5 influence, this will not see any out-of-faction use, except maybe in Sunny. But expect it out of many criminals!